Harvest festival observed by the Pilgrims at Plymouth Americans trace the Thanksgiving holiday to a 1621 celebration at the Plymouth Plantation, where the settlers held a harvest feast after a successful growing season. Autumn or early winter feasts continued sporadically in later years, first as an impromptu religious observance and later as a civil tradition. Squanto, a Patuxet Native American who resided with the Wampanoag tribe, taught the Pilgrims how to catch eel and grow corn and served as an interpreter for them. Squanto had learned the English language during his enslavement in England. The Wampanoag leader Massasoit had given food to the colonists during the first winter when supplies brought from England were insufficient. The Pilgrims celebrated at Plymouth for three days after their first harvest in 1621. The exact time is unknown, but James Baker, the Plimoth Plantation vice president of research, stated in 1996, “The event occurred between Sept. 21 and Nov. 11, 1621, with the most likely time being around Michaelmas (Sept. 29), the traditional time.” Seventeenth-century accounts do not identify this as a Thanksgiving observance, rather it followed the harvest. It included 50 persons who were on the Mayflower (all who remained of the 100 who had landed) and 90 Native Americans. The feast was cooked by the four adult Pilgrim women who survived their first winter in the New World (Eleanor Billington, Elizabeth Hopkins, Mary Brewster, and Susanna White), along with young daughters and male and female servants. “Pilgrims” are often confused with “Puritans”. Two colonists gave personal accounts of the 1621 feast in Plymouth. The Pilgrims, most of whom were Separatists (English Dissenters), are not to be confused with Puritans, who established their own Massachusetts Bay Colony on the Shawmut Peninsula (current day Boston). Both groups were strict Calvinists, but differed in their views regarding the Church of England. Puritans wished to remain in the Anglican Church and reform it, while the Pilgrims wanted complete separation from the church. Who were the Pilgrims or the Separatists? The Separatists, or Independents, were English Protestants who occupied the extreme wing of Puritanism. The Separatists were severely critical of the Church of England and wanted to either destroy it or separate from it. Their chief complaint was that too many elements of the Roman Catholic Church had been retained, such as the ecclesiastical courts, clerical vestments, altars and the practice of kneeling. The Separatists were also critical of the lax standards of public behavior, citing widespread drunkenness and the failure of many to keep the Sabbath properly. Huish’s book The American Pilgrim’s Way…traces the origins of the Pilgrim or Separatist founders of the Plimoth Plantation including Captain Miles Standish, John Winthrop, and Thomas Dudley, from their homelands in England (see below) to the shores of modern day Massachusetts. This volume is an exquisitely decorated art book that contains lavish black and red wood block prints, vintage black and white photographs of English manors, watercolor illustrations of church yards and landscapes, along with facsimiles of historical family specific documents, certificates, and memorials. If you would like to see this rare book, either to study its art work or read up on your favorite Pilgrim, it is housed in the Special Collections and University Archives department located on the second floor of the Bartle Library. The department is open from 10:00 am to 4:00 pm, Monday – Friday. The American pilgrim’s way in England to homes and memorials of the founders of Virginia, the New England States, and Pennsylvania, the Universities of Harvard and Yale, the First President of the United States & other illustrious Americans by Marcus B. Huish; illustrated by Elizabeth M. Chettle. London: Fine Art Society. 1907. Call Number: **E 188. H9 1907. Rare Book Collection, Double Oversized. This issue is limited to five hundred copies of which the University Libraries owns No. 1. Lieut.-Colonel John McCrae, left, author of the poem “In Flanders Fields” from the book In Flanders Fields and Other Poems (1919). During the early days of the Second Battle of Ypres during the First World War, a young Canadian artillery officer, Lieutenant Alexis Helmer, was killed on 2nd May, 1915 in the gun positions near Ypres. An exploding German artillery shell landed near him. He was serving in the same Canadian artillery unit as a friend of his, the Canadian military doctor and artillery commander Major John McCrae. On Veteran’s Day and Memorial Day, this poem is often cited at remembrance services and singular poppies are still worn to commemorate the fallen. The Codex Gigas (English: Giant Book) is probably the largest extant medieval illuminated manuscript in the world, at 92 cm (36 in) tall. It is also known as the Devil’s Bible because of a very unusual full-page portrait of the devil, and the legend surrounding its creation. It was created in the early 12th century in the Benedictine monastery of Podlažice in Bohemia (modern Czech Republic). It contains the complete Vulgate Bible as well as other popular works, all written in Latin. Between the Old and New Testaments are a selection of other popular medieval reference works: Josephus’s Antiquities of the Jews and De bello iudaico, Isidore of Seville’s encyclopedia Etymologiae, the chronicle of Cosmas of Prague, and medical works; these are an early version of the Ars medicinae compilation of treatises, and two books by Constantine the African. Eventually finding its way to the imperial library of Rudolf II in Prague, the entire collection was taken as war booty by the Swedish in 1648 during the Thirty Years’ War, and the manuscript is now preserved at the National Library of Sweden in Stockholm, although it is no longer on display for the general public. The codex’s bookbinding is wooden boards covered with leather, and then ornate metal guards and fittings. At 92 cm (36 in) tall, 50 cm (20 in) wide and 22 cm (8.7 in) thick, it is the largest known medieval manuscript. Weighing 74.8 kg (165 lb), Codex Gigas is composed of 310 leaves of vellum allegedly made from the skins of 160 donkeys or perhaps calfskin. It initially contained 320 sheets, though some of these were subsequently removed. It is unknown who removed the pages or for what purpose but it seems likely that they contained the monastic rules of the Benedictines. The manuscript includes illuminations in red, blue, yellow, green and gold. 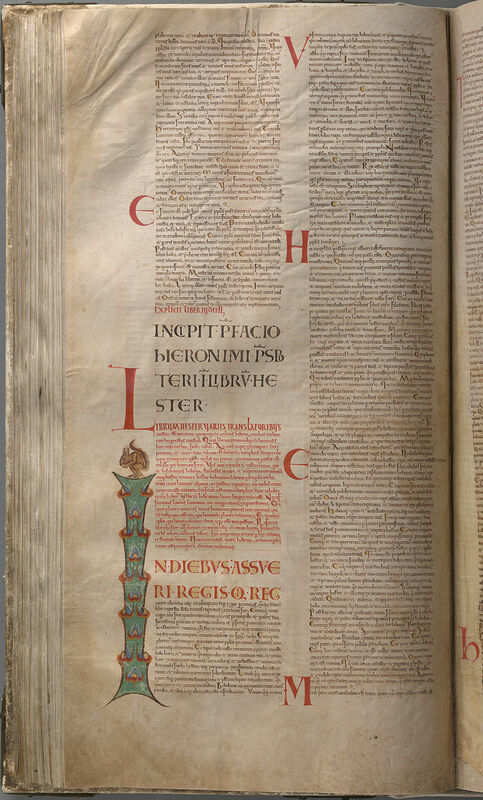 Capital letters at the start of books of the bible and the chronicle are elaborately illuminated in several colours, sometimes taking up most of the page; 57 of these survive (the start of the Book of Genesis is missing). There are also 20 initials with the letters in blue, with vine decoration in red. With the exception of the portraits of the devil, an author portrait of Josephus, and a squirrel perched on top of an initial (f. 110v), the illumination is all using geometrical or plant-based forms, rather than representing human or animal forms. There are also two images representing Heaven and Earth during the Creation, as blue and green circles with respectively the sun moon and some stars, and a planet all of sea with no landmasses. Within books, major capitals are much enlarged, taking up the height of about five to six lines of text, in red ink, and placed in the margins. Less important divisions such as the start of verses are slightly enlarged within the text and highlighted with yellowish ink around the letter forms. 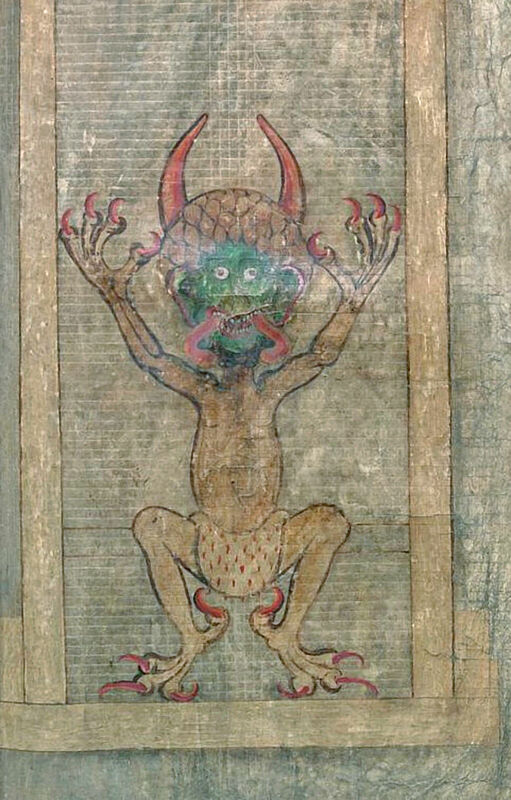 Folio 290 recto, otherwise empty, includes a picture of the devil, about 50 cm tall. Directly opposite the devil is a full page depiction of the kingdom of heaven, thus juxtaposing contrasting images of Good and Evil. The devil is shown quite frontally, crouching with arms uplifted a posture creating a dynamic effect, as if at any moment he could jump up to seize a new victim in his claws. His size is terrifying in itself where he alone fills the entire space of Hell, even though he does not reach up to the tops of the towers. He is naked except for a white loincloth covered all over in small comma-shaped red dashes which have been interpreted as the tails of ermine furs, the distinguishing attribute of a sovereign, in this particular case the Prince of Darkness, a mighty potentate. He has no tail, and his body, arms and legs are of normal human proportions, but his hands and feet with only four fingers and toes each, terminating in large claws, are bestial, as are his huge horns, which, like all his claws, are red as though dipped in blood. He has a large, perfectly round, dark green head, the colour of which reminds us of the deadly sin of envy, and his hair forms, as it were, a skull cap of dense little curls. His eyes are small, with red pupils, which gives him a vicious glare, and his red-tipped ears are large, enabling him to pick up all the gossip and slander entitling him to the souls of the calumniators. His open, leering mouth reveals his small white teeth, and two long red tongues flicker from the corners of his mouth. This doubling of tongues evokes negative associations with serpents, which have forked tongues, and false, double-tongued human beings. The expression ‘forked tongues’ is an ancient one already to be found in the Bible (Nordenfalk 1975, n. 15). Several pages before this double spread are written in yellow characters on a blackened parchment and have a very gloomy character, somewhat different from the rest of the codex. The reason for the variation in coloring is that the pages of the codex are of vellum. Vellum, or scraped and dried animal hide, “tans” when exposed to ultraviolet light. Over centuries, the pages that were most frequently turned have developed this tell-tale darker color. The codex has a unified look as the nature of the writing is unchanged throughout, showing no signs of age, disease or mood on the part of the scribe. This may have led to the belief that the whole book was written in a very short time (see Legend), but scientists are starting to believe and research the theory that it took over 20 years to complete. The length, size, and detail of the codex are of such extraordinary magnitude that legend surrounds its origin, specifically the story that it was written by one scribe in one night with help from the devil. According to one version of a legend that was already recorded in the Middle Ages, the scribe was a monk who broke his monastic vows and was sentenced to be walled up alive. In order to avoid this harsh penalty he promised to create in one night a book to glorify the monastery forever, including all human knowledge. Near midnight, he became sure that he could not complete this task alone so he made a special prayer, not addressed to God but to the fallen angel Lucifer, asking him to help him finish the book in exchange for his soul. The devil completed the manuscript and the monk added the devil’s picture out of gratitude for his aid. In tests to recreate the work, it is estimated that reproducing only the calligraphy, without the illustrations or embellishments, would have taken five years of non-stop writing. Documents on the creation of the German Federal Constitution. The NATO-aligned Federal Republic of Germany (popularly known as West Germany) was formally established as a separate and independent nation on May 23, 1949. It would remain so, divided from the Warsaw-pact aligned East Germany, until German reunification on October 9, 1990. The Federal Republic of Germany, with the city of Bonn as its de facto capital city, was established from eleven states formed in the three Allied Zones of occupation held by the US, the UK and France. The German Democratic Republic (East Germany) was established in October 1949 from the territory occupied by the Soviet Union. The city of Berlin was also divided as West Berlin was later physically separated from East Berlin as well as from East Germany by the Berlin Wall. Konrad Adenauer (1876–1967), German statesman, first chancellor of the Federal Republic of Germany 1949–63, at the German Bundestag, February 1955. Konrad Adenauer became the first Chancellor of the Federal Republic of Germany (West Germany). Adenauer held power for the next fourteen years and during that time refused to recognize the legal existence of the German Democratic Republic. This divisive arrangement was supposed to be temporary, but as Cold War animosities began to harden, it became increasingly evident that the division between the communist and non-communist controlled sections of Germany and Berlin would become permanent. For the next forty-one years, East and West Germany served as symbols of the divided world, and of the Cold War animosities between the Soviet Union and the United States. In 1990, with the collapse of communism, East and West Germany were finally reunited as one nation. The H. Warner Waid Collection -located in Special Collections – consists of over 700 German books, periodicals and government documents such as Documents on the creation of the German Federal Constitution (seen above). Included are German publications from the Weimar era, propaganda from the Nazi era and also U.S. government and military documents from the post-World War II reconstruction era. Today, May 19, is Mustafa Kemal Atatürk’s birthday. Mustafa Kemal was born in 1881 in Thessaloniki, which was part of the Ottoman Empire and died on November 10th, 1938 in Istanbul. Atatürk, which means father of the Turks was the first president of Turkey from 1923 to 1938. He led the National Movement and was the commander during the war of independence against imperialism. He was a nationalist and he advocated the independence of Turkey from all foreigners. In 1923, he found the Republic of Turkey out of ashes of the Ottoman Empire and he transformed the country into a secular democratic nation-state and launched many reforms to create a modern Turkey by bringing a new political, legal, and education system and giving equal civil rights to women. A number of books with information about Mustafa Kemal can be found in Special Collections on the second floor of the Bartle Library. These include Ataturk : a biography of Mustafa Kemal, father of modern Turkey by Lord Kinross, How happy to call oneself a Turk : provincial newspapers and the negotiation of a Muslim national identity by Gavin D. Brockett and Turkey by Arnold J. Toynbee and Kenneth P. Kirkwood. All three of these books are part of the Saeedpour Kurdish Collection. The following book is missing, presumed stolen, from NY Book Fair, March 13, 2017. STEELE [RICHARD]. An Essay upon Gardening, Containing a Catalogue of Exotic Planes for the Stoves and Green-Houses of the British Gardens… York: Printed for Author, By G. Peacock, 1793. 4to (25.7 x 20.1 cm). Description: Later 19th century half calf on pebble maroon paper boards. The front cover is loose, almost off. Raised bands with double gilt lines; gilt title in upper panel; wear to edges. Collation: xxii [Includes Subscribers], , 126, [1-BL], [1-Explanation for plate], 127- 159, [1-Bl], [1-Errata], [1-Bl], 102, [2 –Explanation for plates], [2-BL] pp. + 3 copper engraved folded plates. The text has some edge dusting and minor toning. Plates and Explanation pages have toning and minor to moderate foxing, plates only. The text block has been trimmed slightly, resulting in absence of plate mark at head and tail of plates. Details of plates is not affected, only blank margin inside plate mark. This is scarce complete copy of one of the first publications with identification of origin of exotic plants growing in stoves, green-houses and British gardens. If you have any information, or believed you have been offered this item, please contact Eugene Vigil (360-354-7512) or vigile@comcast.net. Cover of 1908’s Dorothy and the Wizard of Oz located in the Binghamton University Libraries’ Special Collections. Today we celebrate the birthday of L. Frank Baum, known for his children’s books, most famously The Wonderful Wizard of Oz. His first best-selling children’s book was 1899’s Father Goose, His Book. In 1900 Baum wrote The Wonderful Wizard of Oz , which sold for $1.50 at the time. He went on to write 13 more Oz books before his death in 1919. Many generations over the years have enjoyed the story as well as 1939 film version based on Baum’s stories, which had its premier over 75 years ago. Baum didn’t live to see that film, but he was involved in a musical stage play (1903) and early silent films based on his most famous book. A prolific writer, Baum published 55 novels, 82 short stories, and over 200 poems. Along with publishing under his own name L. Frank Baum, many of his books were published under the pseudonyms: Edith Van Dyne, Floyd Akers, Schuyler Staunton, John Estes, Suzanne Metcalf, Laura Bancroft, and Anonymous. Did you know? Baum was born in Chittenango, New York, in Madison County. 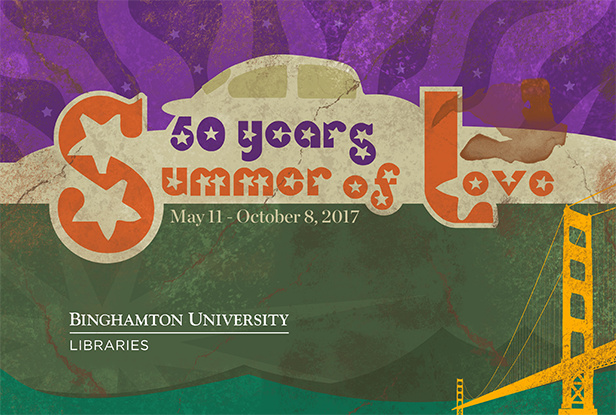 Binghamton University Libraries’ Special Collections holds several of Baum’s works including Dorothy and the Wizard of Oz, The Road to Oz, The Magic of Oz and, of course, The Wonderful Wizard of Oz. Why not stop by and experience the magic of L. Frank Baum this summer? Posted in Books	| Comments Off on Happy Birthday L. Frank Baum!